This week’s photo challenge is “Selfie.” This is me with my newest book, which isn’t even out yet and I’m already halfway through (note the fortune cookie fortune I’m using as a book marker). I won it in a contest. That’s how I do. It’s The Bird Eater by Ania Ahlborn. Yeah, I know. I covered up the title… oops! If you like horror, I’d recommend reading her books. Tell her Adam sent you. It might not get you a discount, but hopefully it’ll bump up my street cred, which is holding steady right around none at the moment. Yes, I’m aware that I could use a shave. 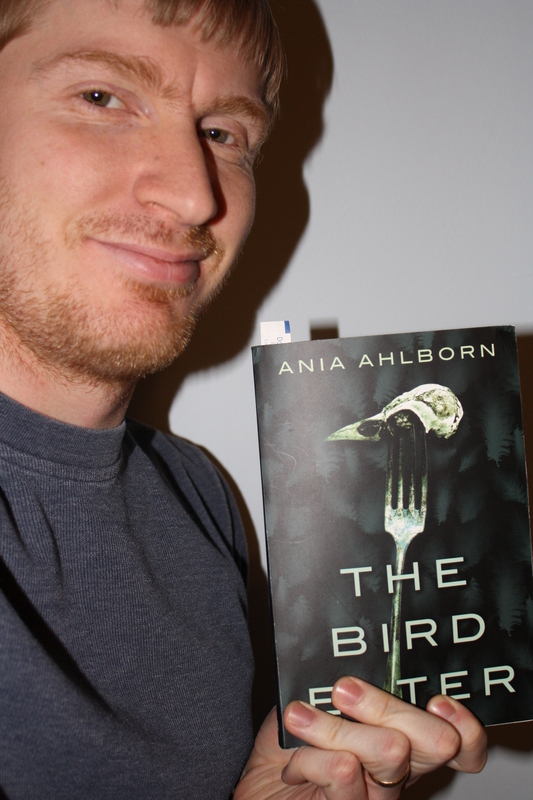 This entry was posted on Friday, February 7th, 2014 at 5:32 PM	and tagged with ania ahlborn, book, postaday, reading, selfie, The Bird Eater and posted in Recommended Reading. You can follow any responses to this entry through the RSS 2.0 feed. I agree. The cover is awesome.